New York, NY – March 21, 2018 – Artificial intelligence and voice analysis are transforming sales, consulting, customer experience and business communication. Today, Say it Media, Inc. (SayIt), announced the availability of LikeSo PRO, an intelligent communication app and management portal that helps professionals speak more effectively and articulately. LikeSo PRO powers a new level of learning and development bringing personalized tools, collaboration and measurable, scalable training to business and higher education. LikeSo PRO is available in the Apple Store and Google Play. The way we speak affects every level of business, from blue collar to CEO. However, according to a survey by Adecco Staffing USA, 44 percent of executives cited soft skills such as communication as the biggest proficiency gap. A 2015 survey found that 93 percent of employers say, “A demonstrated capacity to think critically, communicate clearly, and solve complex problems is more important than [a candidate’s] undergraduate major.” This soft skills gap is a perfect storm. While communications are becoming more important as we evolve socially and technologically, young workers are tethered to their smartphone and are often more comfortable texting than talking. Whereas SayIt’s category-defining and hugely popular application LikeSo: Your Personal Speech Coach was designed for consumer audiences, LikeSo PRO is a more robust and customizable platform built for the enterprise. LikeSo PRO improves communications skills and drives measurable value in critical business and higher-ed use cases. The app benchmarks and strengthens verbal skills in presentation and public speaking, sales training and customer service, new hire training/recruiting and executive presence. Objective, data-driven, measurable analysis including word usage, pace, pauses, dynamic volume, audio playback, etc. SayIt also is announcing a partnership with The Speech Improvement Company (TSIC), global leaders in coaching, to advance professional training by combining proven methodologies with LikeSo PRO’s intelligent learning system. “The combination of A.I.-driven LikeSo PRO with The Speech Improvement Company’s highly trained speech coaches offers significant benefits, far above traditional top-down, one-size-fits-all assessment and analysis,” said Mann Cronin. Since 1964 the professional speech coaches at The Speech Improvement Company have touched more than a million people around the world. With coaches located on four continents, they support an international clientele including Fortune 500 executives, business professionals, politicians, professional athletes, entrepreneurs, and private individuals to strengthen their leadership, management, presentation, and communication skills. For more information, visit www.speechimprovement.com. Say It Media, Inc. was created to advance the traditional corporate learning space by applying new technology to teach soft skills at scale. The company’s category-defining and highly popular application LikeSo: Your Personal Speech Coach is the leading speech fitness app in the Apple Store powered by a voice recognition technology, two practice modes and a proprietary scoring system. In Q1 of 2018, the company launched A.I.-powered enterprise product, LikeSo Pro. 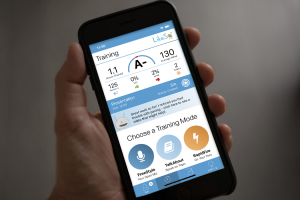 LikeSo Pro improves communications skills and levels the playing field by bringing engaging tools, collaboration and scalable one-to-one training to the enterprise market for unheard of accuracy and understanding of learning. The company was founded in December 2015 by Audrey Mann Cronin, communications expert in the technology industry. Her experienced team includes CTO Jared Alessandroni, a startup veteran and innovator in corporate, A.I. and data management, and Strategic Advisor Mark Curtis, enterprise SaaS entrepreneur. Say It Media, Inc. is a partner of The Speech Improvement Company and National Speech & Debate Association. Visit us on Facebook, Twitter, and Instagram @ LikeSoApp or email us at info@sayitlikeso.com.